Half animal, half plant, 100% creepy. A Curiosity of sorts? Why yes. An Animal? Hmm. Not exactly. That’s because Elysia chlorotica creates chlorophyll, just like a plant. 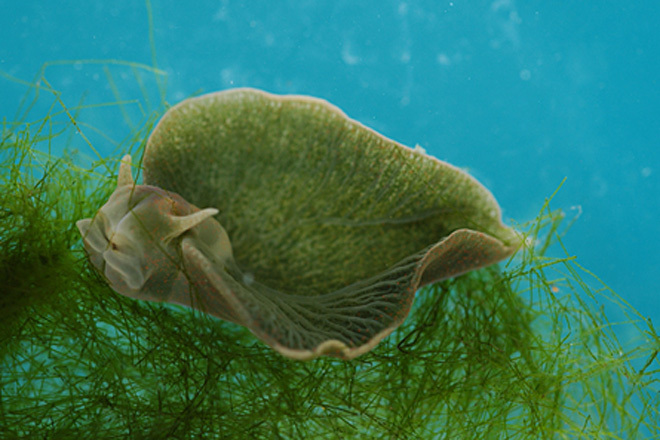 It accomplishes this task by harvesting the genes and photosynthesizing organelles from the Vaucheria algae it ingests. This means the slug is fully equipped to manufacture it’s own food via photosynthesis, which has never been observed in the animal kingdom. It also means that once a young slug eats its first full meal, it never has to eat the algae again. I dunno if it’s *that* creepy. I’d totally hug it. SERIOUSLY, now that is what I call CA REE PEE. Ivan, you would probably hug a slug! That’s interesting that it makes it can make it’s own food. this is an interesting fact ! shame on me cuz I only know about it now .